Bart Starr was one of the most successful quarterbacks in NFL history. During his 16 seasons with the Green Bay Packers, Starr won five NFL championships, an MVP award, and two Super Bowls. 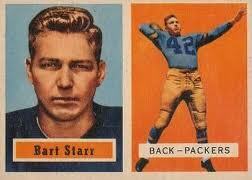 In 1957, when Starr entered the league, football cards weren’t produced on a scale anywhere close to today. As a result, the now iconic rookie cards within the set are both scarce and valuable. The '57 Topps set also includes the first NFL trading cards of Johnny Unitas and Starr's Green Bay teammate, Paul Hornung. It's one of the most popular vintage football card sets in existence and a real challenge to find in high grade. The 1957 Topps Bart Starr is a great card to own; it doubles as an important piece of sports memorabilia and a potentially rewarding investment. There are very few examples of this card at high grades. There hasn’t been a single example that received the grade of PSA 10, gem mint, by the PSA. Only three have received the grade of PSA 9, and two of these cards sold at auction in 2007 and 2011 for over $16,000 and $19,000. Those graded at PSA 8 routinely sell for around $3000. Because these cards are both old and scarce, even lower grade examples, like those at PSA 6, continue to sell for upwards of $450. Collectors seeking high grade Starr rookies for their Packers collection, complete set build or Hall of Fame graded rookie collection, often compete with each other for the few that exist. The two factors that cause the prices to be so high, scarcity and age, are two characteristics that make the 1957 Topps Bart Starr a strong investment. There are very few examples of this card on the market, and their antiquity only raises the demand. These cards can also appreciate significantly in value over time. The increase in sale price by $3000 over four years shows that these cards can increase quickly and leave the investor with a large profit. The fan base of the Green Bay Packers means the card will always be in demand.